Expressions like this one are thought to have come from the playing of drinking games in the taverns of old (mostly North) Europe. 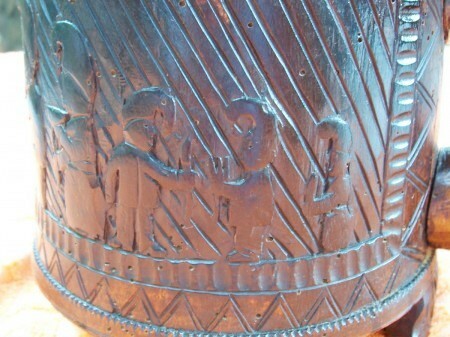 The Baltic Sea area tankards / steins are famous for them and the custom migrated through the well established trade routes over to The British Isles. 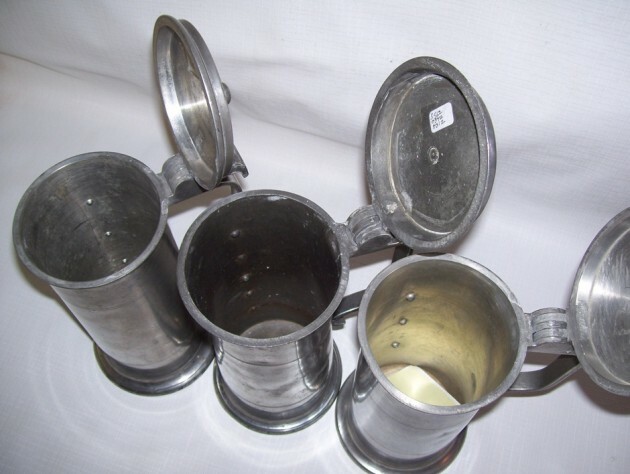 Many old English and Scottish silver steins can been seen with pegs attached to an inside wall. Showing carved relief scenes of “The Gnome King, Andvari”, being cared for by his subjects or family. (Detail) Even the baby gnomes, on the far right, get to bring something to their king! 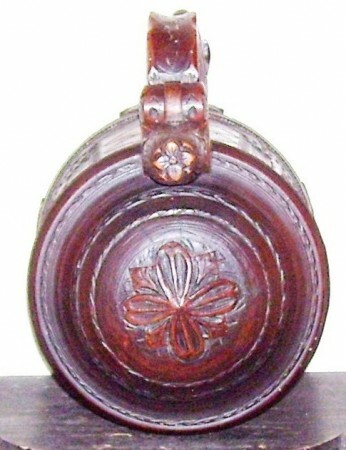 Two views of the unusual and never seen before (or after) ornately carved flower design, with a pomegranate style thumblift. 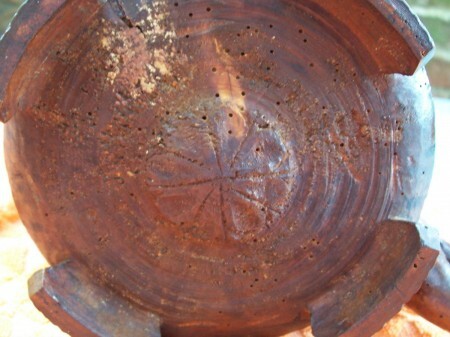 Another interesting touch and not seen often, a carved “rosette” on the bottom. The four hundred year old worm holes didn’t cost extra! 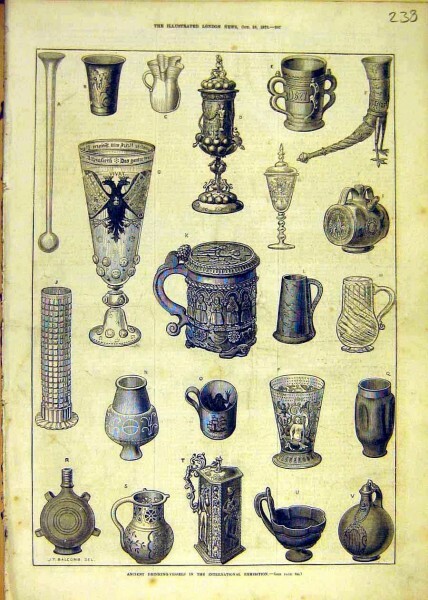 “These vessels became known as “peg” tankards, and were divided into eight sections, each marked off by a peg driven into the wood on the inside of the tankard. 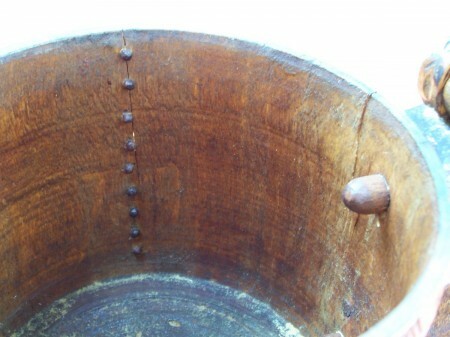 The theory was to prevent a member of a company drinking more than his share , or to a point below the next pin, but apparently it did not have much effect…… (Ed. note: again, who would have been the “pin” police?). “…for we read that in later years Archbishop Anselm [Canterbury 1093-1109] found it necessary to inveigh against the practice of over-drinking, also decreeing: “Ut presbyteri non eant ad potations, nec ad pinneas bibant,” which being translated means that priests shall not resort to taverns or banquets, “nor drink to pins”! “What may be considered one of the oldest drinking vessels in England, with a romantic origin, is a Saxon “peg” tankard in the possession of the Lord Arundel of Wardour. 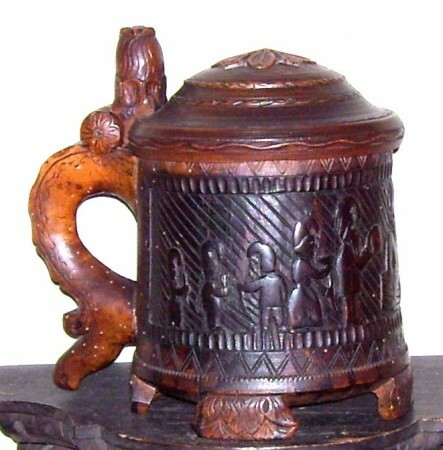 It is known as the Glastonbury tankard and is made of oak which has been heavily lacquered, thus preserving the wood to a marvelous extent.” …(here there is a lengthy description of the religious figures carved on the body)…… “and the feet upon which the tankard rest are three couchant lions. 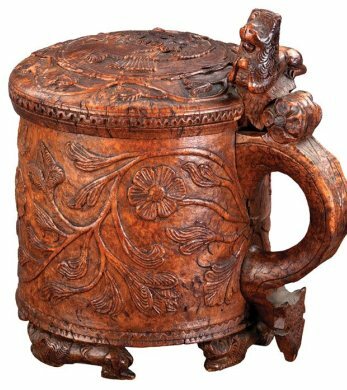 Made about 800 years ago and originally belonging to the abbots of the ancient Abbey of Glastonbury, the tankard commenced its life with a halo of romance around it, for legend has it that it had been blessed at the high table in the refectory hall of the great monastery. 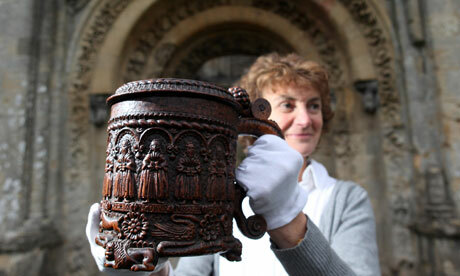 THE GLASTONBURY TANKARD = The large carved wooden one in the middle. 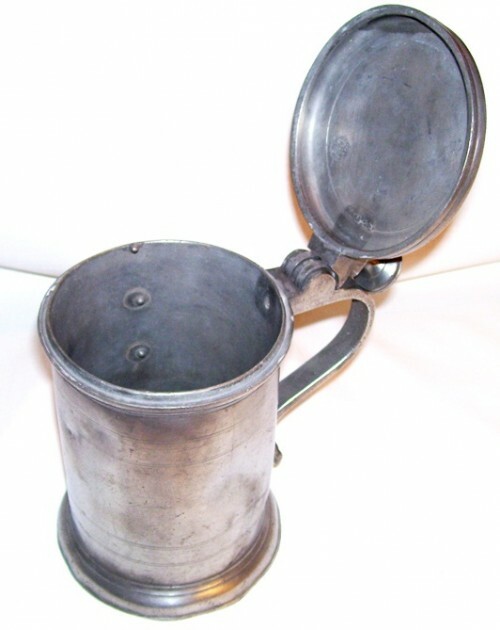 Wagering Drinking Tankards were used In a tavern or Inn, three men would wager who could drink down to the exact level of the first Peg (Fir), and then to the second, and third. The one who missed their mark the most, would have to pay for that round of drinks. 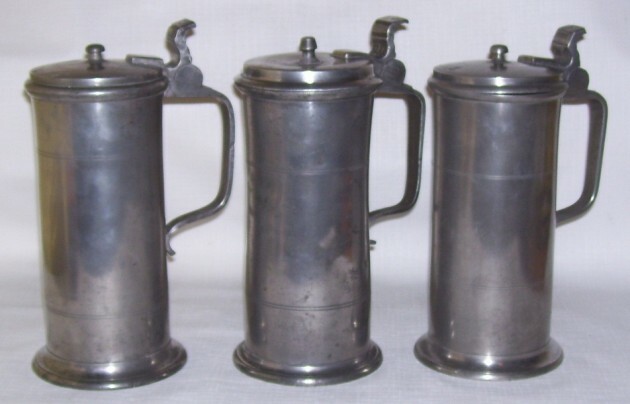 Three large pewter tankards from the Ostfriesland area, close to the North Sea specifically more close to a small sea called “The Wadden Sea.” These steins are all circa 1810- 1830 and are about 9.5 inches in height . 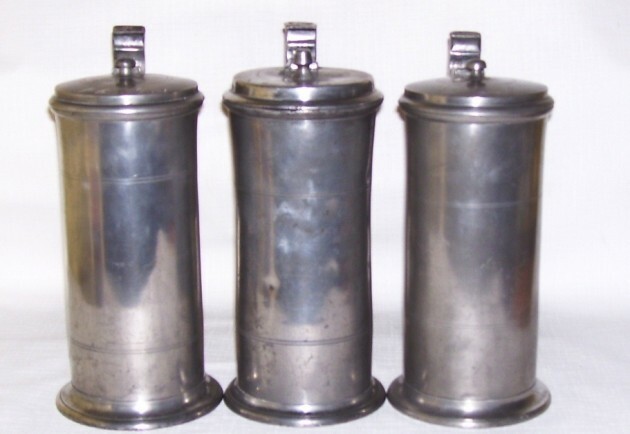 A close up view showing that each is a “peg tankard” The two on the ends having three pegs while the older middle one has four. East Frisian Low Saxon: Oostfreesland) is a coastal region in the northwest of the German federal state of Lower Saxony. It connects Western Frisia (in the Netherlands) with the district of Nordfriesland (“Northern Frisia”, “Northern Friesland”) in Schleswig-Holstein, all of which belong to the historic and geographic Frisia. Ostfriesland consists of the three districts of Aurich, Leer, Wittmund plus the city of Emden. There are 465,000 people living in an area of 3144.26 square kilometres. There is a chain of islands off the coast, called the East Frisian Islands (Ostfriesische Inseln). 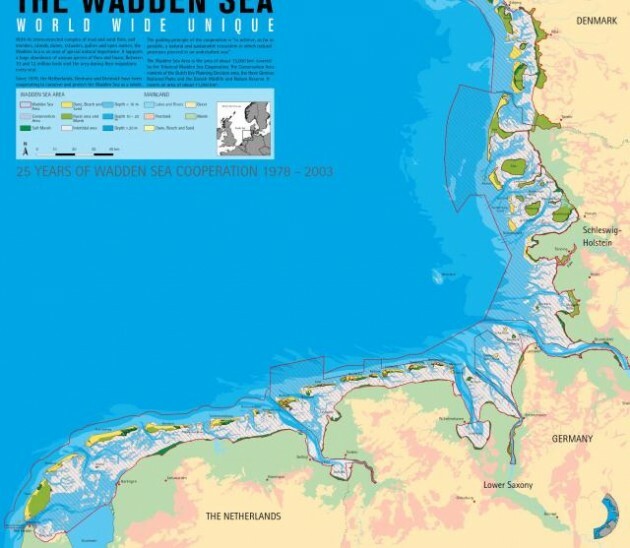 These islands are (from west to east) Borkum, Juist, Norderney, Baltrum, Langeoog, Spiekeroog and Wangerooge. The landscape is influenced by its proximity to the North Sea. The East Frisian Islands stretch for 90 kilometres along the coast. They offer dunes and sand beaches, though in their center they have grass and woods as well. The area between the islands and the coast is unique in the world: the tide leaves a broad stretch of mudflat with creeks that attract an extraordinary number of species, worms and crabs as well as birds or seals. For this reason, the UNESCO World Heritage Fund declared the “Wattenmeer”, which had already been a national park, a global heritage site. Away from the coastal area, much of the physical geography is “Geest” and Heathland. Again I would like to make the point that wooden steins from Scandinavia came from many different Countries – NOT JUST NORWAY as the US stein auctioneers would have you believe! 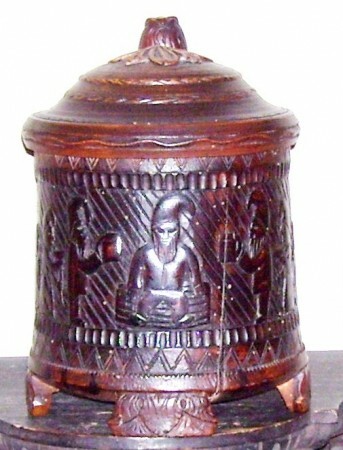 Both U.S. stein auction companies are famous for listing everything wooden as “Norwegian. I have also seen steins clearly made in Estonia being called Norwegian even by Christi’s’ auction house in the USA.! 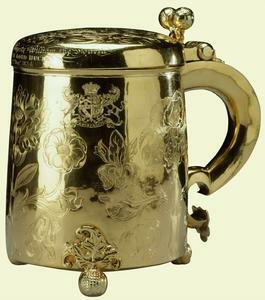 An example from “The Royal Collection” of an older English silver gilt, “pegged”tankard. 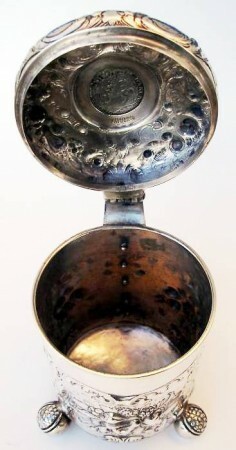 18 x 13 x 18.5 cm. 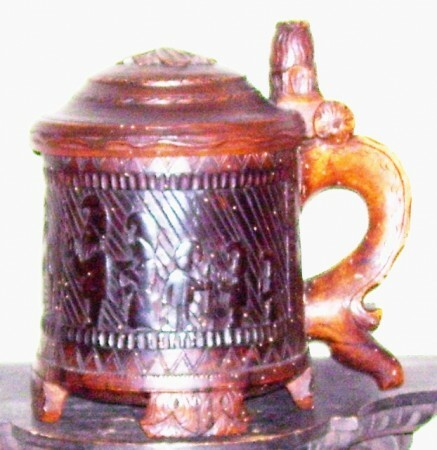 The low squat form, pomegranate feet and thumb-piece of this tankard are closely paralleled in seventeenth-century Baltic and Scandinavian tankards. 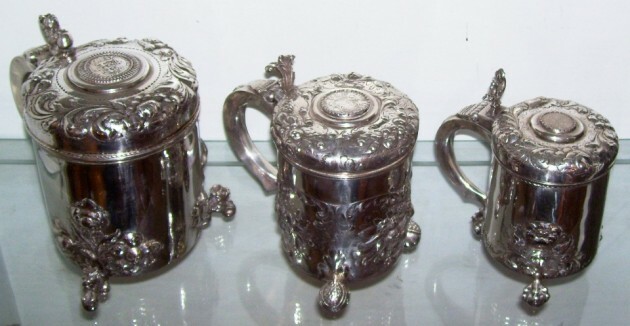 In England peg tankards were made from the mid-1650s through to the 1680s in York, Hull and other north-eastern towns with close cultural links with northern Europe. 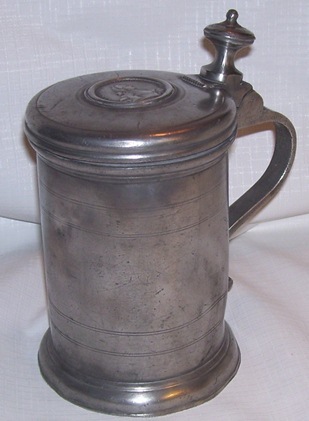 The name ‘peg tankard’ is derived from the vertical row of pegs inside the tankard, used to measure the amount of alcohol drunk as the tankard was passed around the table. 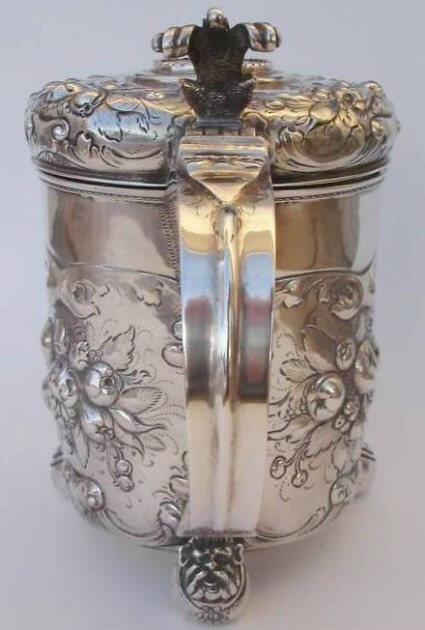 This item belongs to a group of peg tankards made by the York goldsmith John Plummer, many of which (like this one) are finely engraved with highly accomplished botanical decoration. John Plummer (free 1648) was York’s leading goldsmith, his work is comparable in quality (if not in style) to that found in London-made pieces. The engraved decoration on many of his tankards was almost certainly the work of a continental journeyman, described as ‘the most imaginative engraver’ of the Caroline period. It has been suggested that the finely observed tulips and other flowers may have been derived from Hortus Eystettensis by Basilius Besler (Nuremberg, 1613). The date-letter sequence used in York before 1701 is still not fully understood and it is therefore difficult to establish with any certainty the exact year in which this tankard was made. It was presented to William IV by Lord Ducie in 1834 and was one of the few pieces of early plate acquired by that monarch. 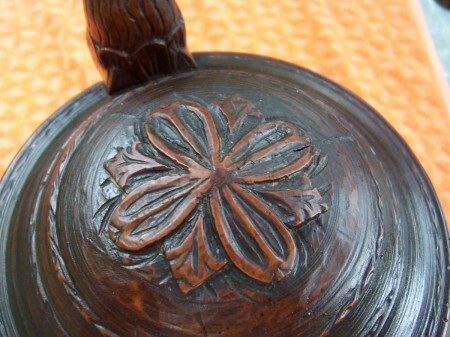 Its earlier provenance is unknown although the lid is engraved with an early version of the Lytton family arms.